Macron is a fink too -- you know he's not a Catholic. More like the French equivalent of George Bush, with all the baggage that entails. When 1 Billion comes in from all around the world to rebuild the Cathedral, I bet a lot of these secular Deep State jokers will skim a little off the top, to pad their already thick bank accounts. I have a good enough memory to remember things 1 and 2 years ago. (imagine that!) The bad guy won in the last French election. Philippe Karsenty, a French elected official was rudely told to stop speaking about the FACT that French Catholic churches are attacked weekly by "host" Mr. Smith because he cannot tell the difference between facts he doesn't like and opinions he doesn't like. This behavior on Smith's part was disgusting and he should be forced to apologize to his guest and to all who can distinguish between fact and opinion. He should be fired if he refuses to man up. It was the Muslims. They're taking over Paris. Been going on for years. Doesn't surprise me. I hope the French rise up and start a literal Crusade and drive the Moors back where they came from. Every last one of them. Mohammed the false prophet is no doubt in Hell, probably in a pit of boiling excrement -- or something worse. I would love to know the demographics of the renovation crew as well as the firefighters. ~70% of the births in Paris are not to Europeans. Watch Saudi money come in for the "repairs." That or Notre Dame's interior will be fully Novus Ordoized. Shephard Smith on Faux News is a disgusting sodomite. Of course he will perpetuate lies, whether directly or by ommission, rgarding the cause of the fire, for it's the nature of sodomites to oppose the truth. Their very grotesque lifestyle is in opposition to the Logos. This is a good question, but I doubt we'll ever get a truthful answer in our lifetime? 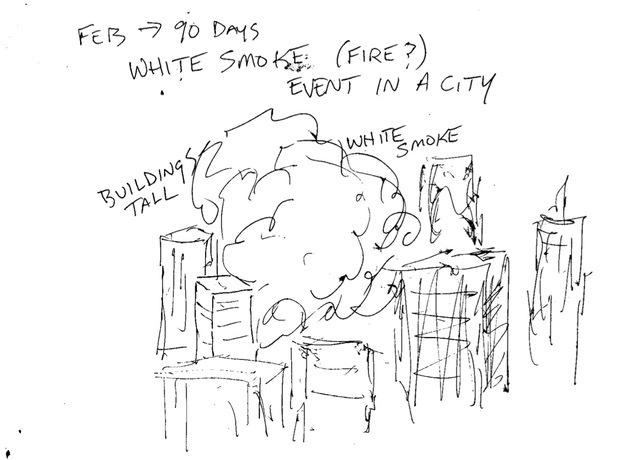 There seems to be a Mossad-style, hi-tech art to burning stone churches? One of those was a four alarm fire in Manhattan's Serbian Orthodox Church. Look at the "roman candle" coming out the front stained glass window. Those who saw it had the same questions? The suspicion an accelerant was used was based on insufficient fuel in the loft to make that fireball. The billionaire François-Henri Pinault announced plans to pledge €100m towards renovation. 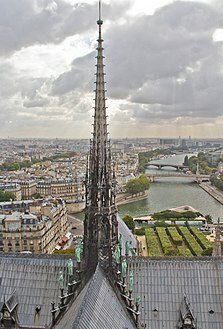 The spire of the cathedral—originally in place between the 13th and 18th centuries, and recreated in the 19th century—was destroyed by fire in 2019. "Rows of wooden pews and much of the nave appears to have been saved, according to the images. “Only a small part of the vault collapsed. Interior seems relatively untouched. Hallelujah!” wrote @CathedralNotre. Ireland's bishop Martin was on RTE this morning. He said all religions and none were shocked at the burning of Notre Dame cathedral, including Muslims. Not one mention of the Catholicism the church represented, more like sad such a museum was burned. Not one mention in the news that Notre Dame was just another church on a long list of attacks on Catholic churches. They are afraid of their lives the truth would cause another French revolution. Heresy, blasphemy, and mortal sin all rolled into one...and par for the course for the conciliar hierarchy from whom the SSPX wants its ecumenical (not canonical) approval. 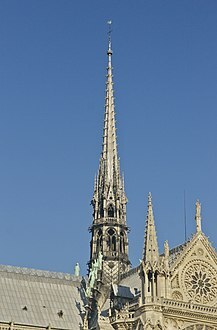 Church officials and the government of France have for years sought private funds to help pay for costly renovations at the cathedral. 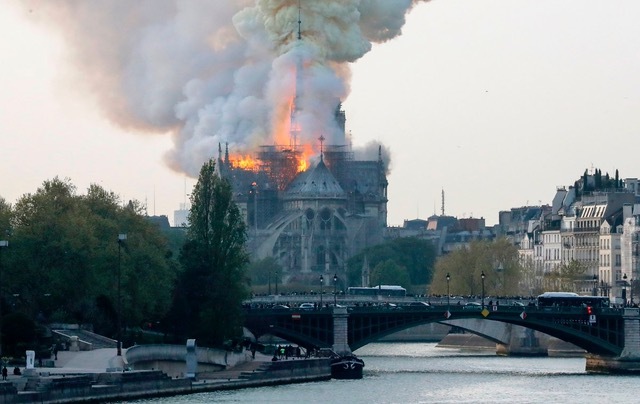 It was in the middle of a $12.5 million renovation financed by the French state when the fire, reportedly caused by an 'accident' in the cathedral's attic, first broke out." According to an SSPX article written last year, Notre Dame has needed and been short on funds for a long time now. So it is good that these have come forward. "Recently [written Feb 2018], the archdiocese asked the goverment to support the vital repairs on the property it owns. The government refused. It states that it already gives €2 million ($2.28 million) a year for this purpose, but this amount only covers basic upkeep. The repairs needed, including removing past restorative efforts, and replacing them with proper materials and techniques, will cost many times more that amount. And Notre Dame is crumbling more every day. Kudos to those Catholic Billionaires who stepped up now. Hopefully, there should be no more problem and the re-building of Our Lady's Cathedral goes ahead properly. Let's pray. Notre Dame as we know is French for Our Lady. Some people foolishly said to rebuild it as a secularist monument. That would be absolutely stupid. It should be rebuilt only as a Traditional Catholic Church in honor of Our Lady. Nonsense. Church in France practically dead and among the most corrupt in the world. If some Frenchment are intent upon rebuilding the Cathedral it's only due to the cultural/historical significance of the church. Most likely they'll inject a modern flare into the rebuild.